1) You 11 need to have your suit jacket or sportcoat modified for this effect. This may be done in either of two ways. One is to have a topit built into the left side of your jacket that feeds into your outer left jacket pocket. (This is a John Cornelius idea). The alternative is to have a chute built into the jacket connecting the inner left jacket pocket with the outer left jacket pocket. In other words, your inner left jacket pocket has no bottom. It's merely a tunnel leading to your outer left pocket. Anything dropped in the upper pocket lands in the lower one. (This is a Steve Bedwell idea.) Any good seamstress should be able to do this. When they ask you why, just tell them you're a magician. I use the latter idea. If you're going to modify the jacket solely for this trick, I think that's the way to go. However, if you're one of the many magicians who already has a topit built into your jacket, that will permit you to perform this effect. 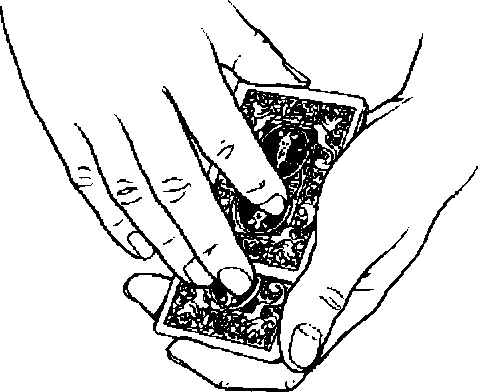 2) Place a card, back outward, in your outer right jacket pocket. This may be any card from the deck you're using or another matching deck. (The audience will never see the face of this card.) I usually use a joker, so for the explanation I'll assume that's what the card is. 4) You should also have two permanent marking pens.